The world's largest PR firm increased growth slightly in 2017 over the prior year, but it still has work to do to break the coveted $1 billion revenue barrier - U.K. revenue inched up 0.9%. 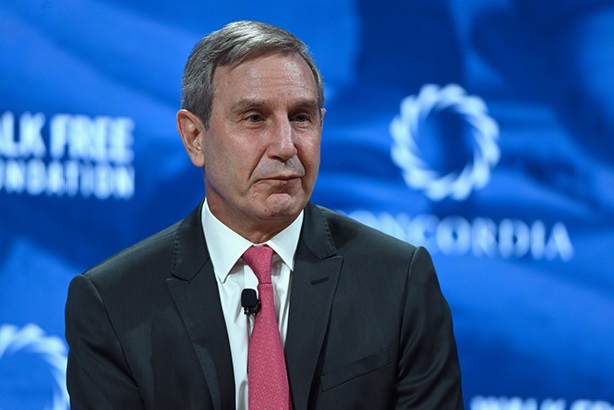 Edelman's eponymous president and CEO Richard Edelman. NEW YORK: Edelman posted organic growth of 3% in the U.S. last year, increasing revenues from $532.9 million to $549.1 million – global returns were up 2.1% from $875 million to $893.6 million. In the U.K., Edelman grew 0.9%, rising £540,000 from £60.16 million to £60.7 million. Asia-Pacific revenues in the calendar year increased 2.4% from $105 million to $107.5 million. These numbers were slightly up on 2016's perfromance, when Edelman's global revenues grew 1.7% organically from $854 million to $875 million. U.S. figures were in line with global performance in that year. New York is the firm’s highest revenue-producing office, bringing in $168.9 million in 2017; San Francisco was the fastest-growing, up 18.5% on the previous 12 months – a $5.9 million increase. "We grew 2.1% and that’s not great," the agency’s president and CEO Richard Edelman told PRWeek. "The U.S. was the best performer. Europe pretty much flat-lined. Asia saw some growth. The Middle East was down because the oil price is down. The best performer was consumer-facing brands. Tech was off a little for us and so was healthcare a tiny bit." Performance in the second half of the year accelerated to 3.4%, counterbalancing a tougher first half. Key account wins included Chobani and Yamaha in the U.S., and Nissan and Vantiv in the U.S. and U.K. In the U.S., the firm stopped working with the National Association of Manufacturers, Avanade, and Zagg. "The first half of the year was worse than the second," said Edelman. "We were at zero growth and then we grew 3.4% in the second half, so the average was 2.1%. We’re going into 2018 up and, if it continues, our fiscal-year performance [Edelman’s financial year runs from July to June] will be more like 4% growth." However, Edelman discounts the likelihood of an immediate return to the days of double-digit or high-single-digit growth the firm achieved between 2010 and 2015. In 2015, Edelman grew 7.2% year-on-year organically, compared to 8.2% in 2014, 11.4% in 2013, and 9.6% in 2012. "It’s not like we’re getting 10% or something, not a chance," he said. "I would love that but it doesn’t seem doable because of things like procurement. We [now] have sizable enough budgets for [those] people to look at us. Cost of goods is also higher, meaning if you want to be in the brand business you’ve got to have creatives and they’re higher priced than PR account executives." Two particular bright spots were Edelman Intelligence, which grew 20% year over year; the firm’s sports, entertainment, and experiential unit, United Entertainment Group, was up 17%. "CCO budgets are under squeeze," added Edelman. "Marketing is more where the money is. If we’re relying on CCOs we’re not going to grow as an industry, because every evidence is that’s considered overhead." At the end of 2017, the firm employed 5,940 people across the world in 77 offices, up from 5,903 compared to 12 months prior; 2,652 of those individuals are based in the U.S., up from 2,625 in 2016. Staff numbers in the U.K. stayed steady at 497, down three from the previous year. Overall staff turnover in the year hit 30%. In the year, notable leavers included David Brain, president and CEO of the firm’s APACMEA region; global technology chair Natalie Kerris; global corporate chair Kathy Beiser; global MD of integrated media Chris Paul; global business and social purpose chair Bob Knott; global public affairs chair Stephanie Lvovich; and Atlanta GM Alicia Thompson. Jesse Lin took over the APAC CEO duties formerly handled by Brain; Carol Potter moved from APACMEA vice-chairman to president and CEO of Edelman Europe, taking over from Michael Stewart, who became global vice-chairman for Europe; Mark Renshaw came on as global brand practice chair; and Lisa Ross joined as president of Edelman’s Washington, DC office. Four of the agency’s 13-strong C-suite are female.